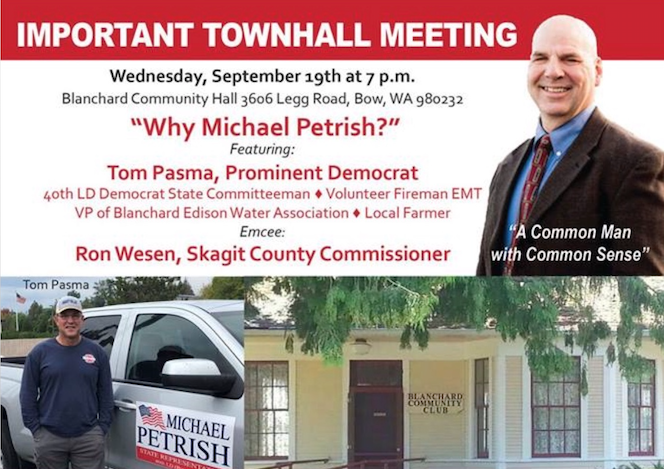 In early September, the Committee to Elect Michael Petrish campaign sent out a mailer to some voters in the 40th LD, promoting a September 19, town hall meeting titled, “Why Michael Petrish?” that was held at Blanchard Community Hall, in Bow, Washington. The mailer displayed a photo of Tom Pasma, advertised as a “Longtime Prominent Democrat,” who would be the featured speaker at Petrish’s town hall meeting. The photo showed Pasma standing next to a “Michael Petrish for State Representative” campaign sign displayed on a silver pick-up truck. 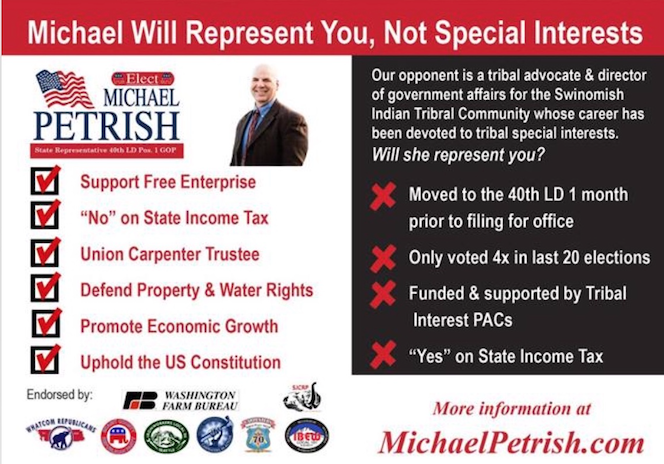 Petrish’s campaign mailer advertising his September 19 town hall meeting stated that “Michael Will Represent You, Not Special Interests.” Those special interests were identified in the mailer as “tribal special interests.” On one side of Petrish’s mailer, in the section referencing Lekanoff, the word “tribal” was used four times. Listening to an audio recording of Petrish’s September 19, town hall meeting, at which Pasma was the featured speaker, and listening to a podcast of Pasma’s September 29 appearance as a guest on local Tea Party conservative Kris Halterman’s Saturday Morning Live (SML) talk radio show, shed some light on Pasma’s new found love for the Republican candidate. The audio recording of the town meeting was provided to The Searchlight Review by an attendee of the event. Both men seemed unaware of the fact that Lekanoff had actually moved into the district in the last week of December 2017, which was approximately 2 and a half months before Representative Kristine Lytton (D-Anacortes) had announced on March 14, that after holding the seat since 2010, she would not be seeking re-election because she would be retiring after her term ends this year. And, most importantly, Petrish and Pasma ignored the fact that Lekanoff has resided in Skagit County for 16 years. In his opening remarks, Pasma did not identify who or what those supposed “special interests” were which he said he knows his friend, Michael Petrish, would not be representing. Petrish then introduced himself to the town hall audience and began speaking, and surprisingly, he started things off by bringing up the Gateway Pacific Terminal (GPT) project that had been proposed back in 2011. He blamed his opponent, Lekanoff, for the ultimate denial of the contentious project by the United States Army Corps of Engineers, which occurred on May, 9, 2016. “The reason I say that, is my opponent in this race represented the Lummi Tribe, petitioning the Army Corps of Engineers to deny the permit for the Gateway Pacific Terminal in Whatcom County. Now, regardless of how you feel about coal, that was gonna be a deep water port for Whatcom County. Coal was just one of the products that was gonna be shipped out of there…But, I represent Local 70 out of Mount Vernon, which represents five counties in the state of Washington. 1800 members and their families which I represent. I’m a trustee of my Local…And the reason I bring up 1800 families and our carpenters that live and work in these five counties, is that a majority of our members were gonna be employed in that project had it been built. That rant by Petrish reveals his numerous attempts to blame the ultimate permit denial of a proposed coal export terminal on his opponent, a Native woman, which is not only factually incorrect, but when mixed with his marginalizing Native Americans by pointing out a population percentage, it falls right in line with the colonialism and white supremacy that shaped the United States. The proposed GPT project was a 48 million ton per year coal export terminal proposed by Pacific International Terminals/SSA Marine, to be located at Xwe’chi’eXen (Cherry Point), in Whatcom County, along the Salish Sea shoreline. Xwe’chi’eXen is the ancestral territory of the Lummi Nation. The Lummi, a Coast Salish people, are the original inhabitants of Washington state’s northernmost coast and southern British Columbia. The Lummi Nation, a self-governing nation, is the third largest tribe in Washington state, and their nation stood steadfast in its opposition to the project. Tens of thousands of people stood alongside Lummi Nation in opposition to what they considered to be a potentially devastating project. Petrish did not provide his audience any evidence to substantiate his assertion that Lekanoff “represented the Lummi Tribe in petitioning” the Army Corps to deny the GPT permit. Also, for Petrish to have proclaimed to his town hall attendees that Lekanoff, “torpedoed the project,” when there is no evidence to support such a claim, shows he is willing to fabricate a story scapegoating his political opponent for some perceived wrong, potentially inciting animosity toward her, toward Lummi Nation, and toward Native Americans in general. This was followed by loud applause from the audience. It is curious that Petrish called for Lekanoff to “own up” to being a lobbyist for the Swinomish Tribe.” In the 2018 General Election Voters’ Guide, the very first thing listed under Lekanoff’s name are these five words: “Swinomish Tribe Governmental Affairs Director,” and that fact is also clearly stated on her campaign website, so the idea that she needs to “own up” to something sounds like an attempt to manufacture a negative. Lekanoff’s campaign website states that her “career has provided the opportunity to engage on vast issues and layers of government at international, federal, state, and tribal levels and to work towards our shared vision of clean water for our families and our fish and wildlife.” Her experience is much more than the narrow, little box Petrish tried to put her, and her experience, into when talking to his audience. “Casinos do not have to reveal how much money they give to the opponent. They’re a sovereign nation.” Petrish added, “Just throwin’ that out there.” Apparently, Petrish had no problem with just throwin’ multiple falsehoods out there to the audience listening to him that night, fueling the anti-tribal treaty rights and anti-tribal sovereignty thinkers who were peppered throughout the audience. It appears from Petrish’s remarks that he is equating Native American Tribes and Nations with casinos, as if those are synonymous, which they certainly are not. Moreover, according to the Washington State Public Disclosure Commission (PDC) online reports, there have been no casinos which have contributed to Lekanoff’s campaign. There have been numerous Native American Tribes and Nations which have donated to her campaign, as it should not be surprising that they would want to support a well-qualified candidate as they often do in elections, and especially one who is also Native. If elected, Lekanoff would be the only Native woman in the Washington state Legislature. All of the contributions made to Lekanoff’s campaign, just like with any candidate running for elected office in Washington state, must be reported to the PDC. The PDC’s website publishes those filed reports and records on its website, which are accessible to the public. It is easy to look up those contributions and see that contrary to Petrish’s allegation, the Lekanoff campaign has been reporting the contributions it has received from Native American Tribes and Nations, and from the rest of the contributors, of which, individuals make up the largest percentage. As for Petrish’s claim that his opponent is taking money from the “environmental lobby,” which he characterized as a special interest, according to the PDC, Lekanoff’s campaign, so far, has only received one contribution from any environmental-related entity, and that was a $1,000 contribution made by Washington Conservation Voters, on August 28, 2018, for the general election. It appears that Petrish’s claim of “special interests” is really code for Native American Tribes and Nations. Petrish cries “special interests” in terms of Lekanoff’s campaign receiving contributions from Native American Tribes and Nations as though that is some kind of foul, yet in his leadership position on the Regional Council Executive Committee for the Pacific Northwest Regional Council of Carpenters, he represents the interests of unions and their members. Throughout his town hall meeting, Petrish talked often about his union carpenter job and the thousands of union members he represents not only in Washington, but also five other states. Among the contributions Petrish’s campaign has received, are contributions from a number of unions, from Andeavor Refinery where he works, and from a builder PAC. Why then, are Native American Tribes and Nations singled out as “special interests”? The Searchlight Review reached out to Debra Lekanoff this week and inquired about her having moved. In a phone interview, Lekanoff said that she moved the last week of December 2017, from West Mount Vernon to Samish Island. She said that she changed her voter registration address in April to reflect her new address at Samish Island. Samish Island, which is in the 40th LD, and West Mount Vernon, which is in the 10th LD, are both within Skagit County, where Lekanoff has resided for 16 years. It is likely that Pasma was only referencing Lekanoff’s voter registration information when he constructed his version of the timeline for her move which landed her in the 40th LD. Not only is Pasma inaccurate when he has repeatedly claimed that Lekanoff moved into the 40th LD only one month before candidate filing week, but again, it’s important to keep in mind Representative Kris Lytton had not even announced until March 14, 2018, that she would be retiring and would not be seeking re-election. Additionally, during that September 29, SML show, Halterman introduced Pasma as “the current State Committeeman for the 40th District Democrats,” and later in the show, she also described him to listeners as being, “in a position of leadership with the 40th District party.” At the conclusion of the show, Halterman asked Pasma how listeners can contact him to ask questions because he is “in a leadership position there for the 40th.” In all three instances, Pasma did not correct Halterman, nor did he inform listeners that, in fact, he was no longer in that leadership position with for the 40th LD Democrats at that time. 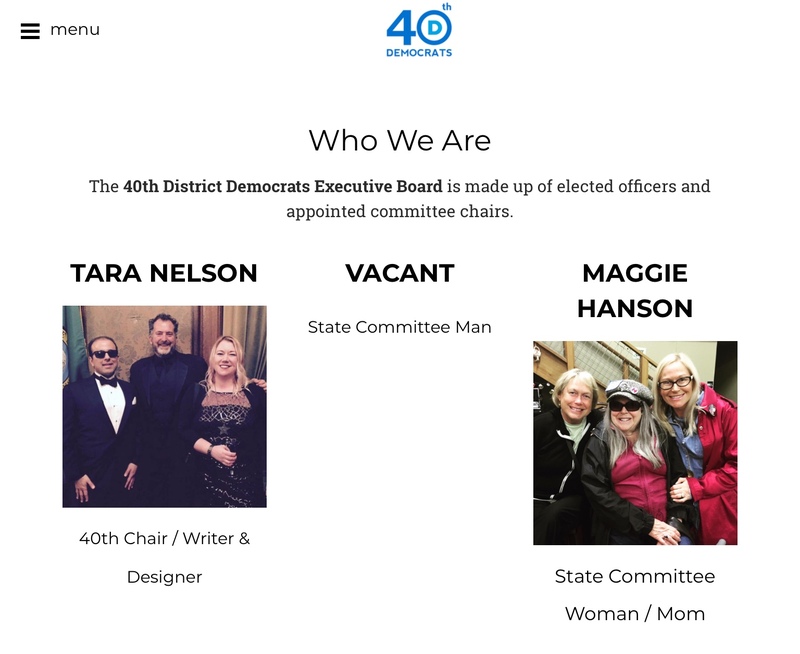 According to Tara Nelson, Chair of the 40th LD Democrat’s, Pasma resigned on September 12, 2018, and that resignation was to be effective on September 16, following the September 15th-16th Washington State Democrats committee meeting. Nelson explained, as it turned out, Pasma did not attend the September 15th-16th state committee meeting, after being asked not to attend by state Democratic party leadership. In listening to Pasma’s intensive focus on Lekanoff having moved, and her subsequent decision to run for the 40th LD House seat which he also ran for unsuccessfully, his motivation appears to be more than simply “informing” voters as he claimed to SML listeners. It seems more a case of trying to find something about Lekanoff that he believes might cause voters to be suspicious and distrustful of her motives, and might garner votes for Petrish, but would keep him from having to say that it’s because she is a Native woman who has worked for the Swinomish Indian Tribal Community for 16 years. Pasma’s focus on Lekanoff’s less than long term residency in the 40th LD, and on her voting record, seem more like providing cover or justification for what is really at the heart of his negative feelings about Lekanoff’s candidacy. Each time Pasma tried to put into words what his concerns were about Lekanoff during his speeches at Petrish’s town hall meeting and during his time on the SML radio show, he struggled to communicate that clearly, and in understandable, complete thoughts. Again, according to PDC online reports, there has only been one contribution (for $1,000) made by a group/organization that could potentially fit what Halterman characterizes as “non-fossil fuel,” and that is Washington Conservation Voters, so it appears that what she is really pointing out, are the contributions made by Native American Tribes and Nations. After Halterman’s reference to the campaign contributions from various Native American Tribes and tribal organizations Lekanoff has received, she said, questioningly, to Pasma, “I’ve heard that she [Lekanoff] moved in there, or she got this address in April of 2018”? That same information Pasma referenced was originally brought out in a primary election campaign mailer that another Democrat primary candidate for 40th LD state representative, Rud Browne, sent out to voters in the district, shortly before the August 7, 2018, primary election. Browne presently serves on the Whatcom County Council after he was re-elected in the November 2017 general election. Numerous individuals have expressed their disapproval of that mailer disseminated by Browne’s campaign as they felt it contained racist overtones aimed at Lekanoff and the campaign contributions coming from Native American Tribes and Nations, and thought it especially objectionable that a Democrat chose to use that particular campaign strategy against a fellow Democratic candidate. Browne’s campaign couched the language used to identify two of the categories, such that, it could appear as a fairly acceptable campaign strategy. However, the “Percentage of donations received from outside the district” category took aim at contributions Lekanoff’s campaign had received from Native American Tribes and Nations at that time, and the “Receiving independent expenditure PAC support” category took aim at the local, Native American-led Seven Generations PAC. According to PDC online reports filed, the only Independent Expenditure support Lekanoff’s campaign has received, so far, is from the Seven Generations PAC. Rud Browne’s campaign mailer featured text at the top of one side that stated, “Democracy requires you to stand up and be counted.” The mailer compared certain categories in terms of the four Democratic candidates who were vying, at that time in the primary election for the 40th LD state House seat. There were six categories chosen by the Browne campaign and used in the mailer to compare the four Democratic candidates: voting record in Washington state primary and general elections for the last 10 years; years of residency in the 40th district; receiving independent expenditure PAC support; percentage of donations from outside the district; publicly-listed endorsements from women; and filed personal financial statement as required by the public disclosure commission. Each of the categories specifically selected by the Browne campaign to highlight in the campaign mailer were apparently ones Browne’s campaign thought voters would interpret positively in terms of his candidacy, and which voters may potentially interpret negatively in terms of Debra Lekanoff’s candidacy. 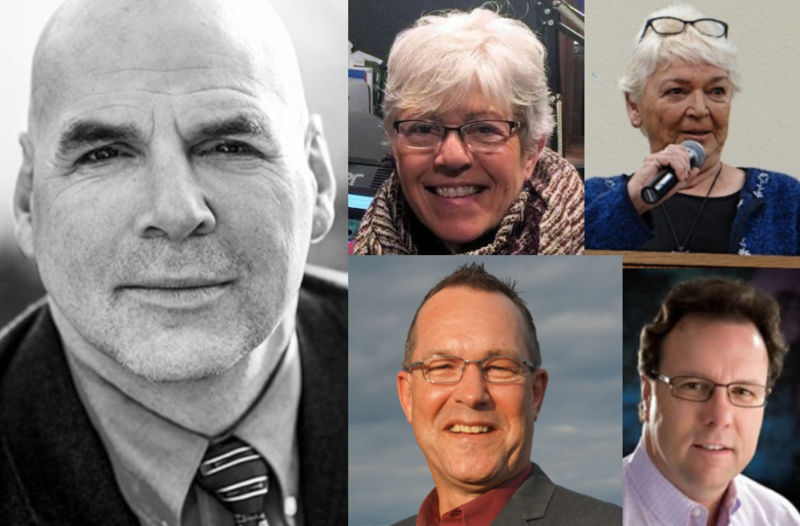 According to some local Democratic Party members, the four Democratic candidates running for the 40th LD House seat had agreed, at the time of the primary election endorsements, that there would be no negative campaigning against their fellow 40th LD Democratic candidates. Full disclosure: This reporter also posted a comment under Ramel’s August 3, Facebook post, and strongly criticized Browne’s action of having sent out such a mailer. 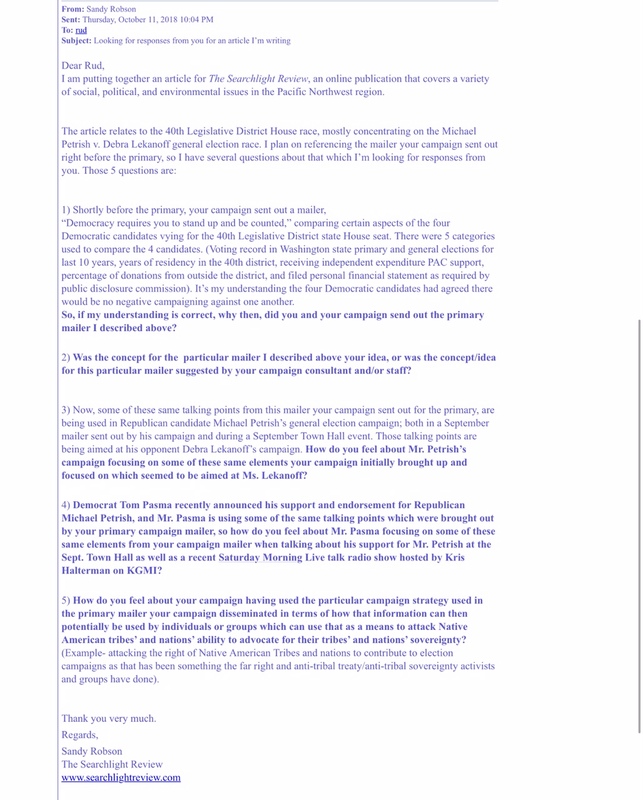 Recently, The Searchlight Review contacted Rud Browne, via email, with five questions relating to his campaign mailer sent out shortly before the August 7 primary. “I remain loyal to the progressive ideals and values that originally made me run for office. I have made no public comments regarding Debra Lekanof since the Primary election and I have no intention of doing anything that could negatively impact the outcome of the upcoming General election. There were no questions from Browne contained in his email to The Searchlight Review. Pasma, during the September 29, SML radio show, asserted that “special interest is driving that [Lekanoff’s] campaign.” At the same time, he claimed that he doesn’t think there is anything wrong with for-profit corporations contributing to campaigns, or with “tribal money” being contributed to campaigns. Pasma never corrected either Halterman or Michael Petrish after they identified what they are calling “special interests.” So, for Pasma to claim he does not have a problem with “tribal money” seems disingenuous. “Um, you know, uh, it, if, the basics of your question is where you live in the district, your voting record, just simple things like that, and you have done everything you can to, um, put everybody down as much as you can when you answer those in the primary, what would you do if you were elected…But, I was really amazed, and I guess appalled, that some of the special interests, um, um, that absolutely do not have any, um, wanting to, actually, solve the problem. They just keep it front and center to bring money in. And, as someone, um, and I’ve seen that this time and I was just amazed. I mean, just, you know you need to solve those problems. We need to work together to solve those problems. After transcribing Pasma’s entire jumbled response to that question posed to him, it’s clear to this reporter that he cannot articulate, whatsoever, his concern that Lekanoff would put tribal interests ahead of other people’s interests. Petrish provided no reason for his having interjected the concept of bribery to the audience as he presented no correlation for that in terms of any factual information having to do with the 40th LD House race. Petrish then went on to tell his town hall attendees that he figured his campaign would spend around $50,000 for the November general election, and said, “I’m up against a $150,000, $200,000, $300,000 from the casino money, from the environmental lobby.” Petrish also claimed: “Money that’s comin’ from casinos, $300,000,000, sittin’ in a bank account for the Tulalip. One account, to devote.“ He did not provide any source for his claim about a bank account pertaining to the Tulalip Tribes. Again, according to PDC online filed reports, the only contribution made, so far, to Lekanoff’s campaign from an organization that would be considered “environmental lobby” is one single contribution for $1,000 from Washington Conservation Voters. Contrary to the dollar figures Petrish tossed around to his town hall audience, Lekanoff’s campaign has received approximately $31,000 in cash contributions made by Native American Tribes and Nations, and $2,000 in cash contributions from the Northwest Tribal PAC. And, there has been approximately $15,000 in Independent Expenditure monies spent in support of her campaign, by the Native American-led Seven Generations PAC. The rest of the approximate $135,000 total in cash contributions Lekanoff’s campaign has received, so far, has come primarily from individuals (her largest category of contributors), various unions, Democratic Party PACs, House Democratic Caucus, a small amount from businesses, and a small number of other miscellaneous contributors. Hearing Petrish throw around the words “casinos” and “casino money” repeatedly to his audience, and then hearing him throw around big dollar figures which did not reflect the reality of the contributions made by Native American Tribes and Nations to Lekanoff’s campaign, could drive anti-Indian* resentment amongst voters who already share his way of thinking, or those who may entertain that way of thinking. Petrish’s reference to former Governor of Washington state, Christine Gregoire, being called, “the Indian Princess” echoes Elaine Willman, who was the keynote speaker at the July 28, 2018, Skagit County Republican Party’s Summer Salmon BBQ, held at Skagit River Play Fields, in Burlington. Michael Petrish was one of the fifty or so attendees at that July 28, summer BBQ event, and according to a video recording of Willman speaking at the BBQ, posted on YouTube on August 4, 2018, he was there for Willman’s speaking time during the event. During her speech at the Skagit Republicans’ BBQ, Willman had sarcastically, and offensively, referred to Gregoire as “the real Indian princess [bolded emphasis Willman’s],” as she has done numerous times at multiple speaking events throughout Washington state, which is then always followed by her version of then-Governor Gregoire having renegotiated (back in 2005/2006) the gambling compact regarding revenue sharing agreements for tribal gambling between Washington state and the Spokane Tribe. The final compact included a provision that allowed other tribes to expand casino operations without revenue sharing. Back at that time, twenty-seven of the state’s 29 federally recognized tribes signed on to the Spokane compact’s provision. Not all of those tribes operate casinos. 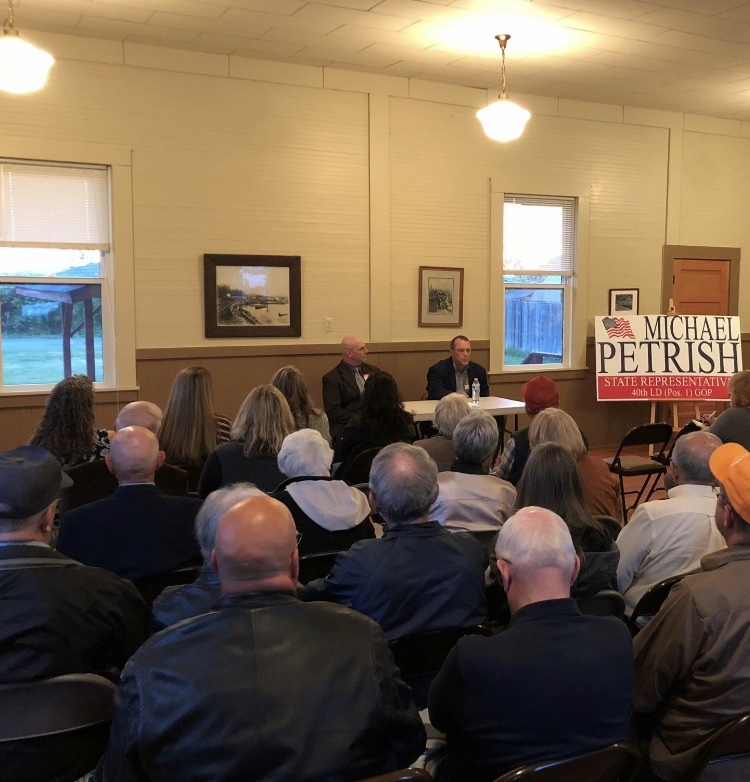 Petrish’s negative talking points to his town hall audience about what he claims happens to an area when a casino is built, were similar to Willman’s ideas on that subject which she also talked about at the Skagit Republicans’ Summer Salmon BBQ. In their negative narrative about tribal casinos, both Willman and Petrish neglect to point out that tribal casinos across Washington state further tribes’ self-determination, have evolved into cultural and regional economic centers which are major employers, have contributed millions of dollars to charities annually, millions of dollars to local governments for local infrastructure projects, millions of dollars to health and education programs around the state, and these are just some of the positive impacts. Willman is recognized by many as a national leader in the anti-Indian movement, and she is a current executive board member and former chair of the Citizens Equal Rights Alliance (CERA). Individuals and groups like CERA, which are part of the modern anti-Indian movement, disavow and/or deny tribal sovereignty, and they seek to terminate tribal governments and break federal treaties signed with Native American tribes. 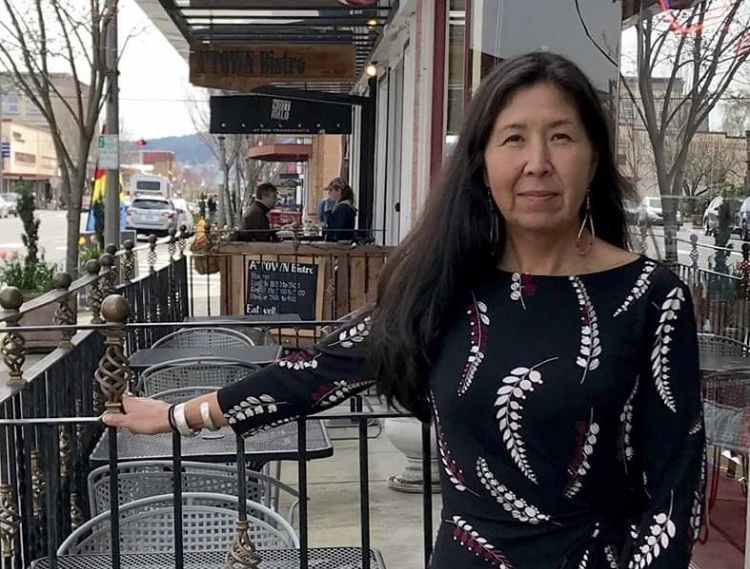 SML radio host Kris Halterman has had Willman as a guest on her show multiple times to discuss what she describes as tribal issues and Federal Indian Policy. One of the times Willman was on SML, she was there to promote a CERA conference held in Bellingham, at the Lakeway Inn, on April 6, 2013, as she was one of the featured speakers. The speakers and material presented and discussed at the conference can easily be considered anti-Indian. A Washington State Supreme Court decision earlier this year upholding a lower-court decision ordering barriers to salmon migration be removed, capped off a seventeen year-long legal battle, and compels Washington state to fix or replace hundreds of culverts that block fish migration. Culverts are structures that enable streams to pass beneath roads and railroads tracks, but can sometimes block migrating salmon if those should become blocked, or if those are too steep for the fish to navigate. The culvert case is an extension of a historic federal case, the 1974 Boldt decision. 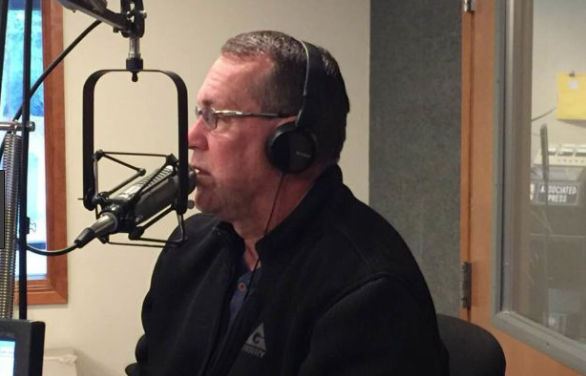 For Petrish to float the idea of legislation he might propose, if he were elected to state House, to force tribal casinos to pay fees to be used for culvert repair, is a particularly reprehensible idea. The need for culvert repair or replacement is a direct result of Washington state having poorly designed infrastructure that can decrease, or even exhaust, fish runs which Native American Tribes and Nations depend on, and which are secured to them by treaties with the U.S. government. Petrish’s campaign slogan displayed on his campaign website and on his campaign mailers is, “A common man with common sense.” From listening to Petrish and Pasma speak at the September 19 town hall meeting, and from hearing the idea Petrish proposed to Elaine Willman and others present at the July 28 Skagit Republican’s BBQ which he said made “perfectly common sense” to him, Petrish’s sense of things seemed centered around anti-tribal sovereignty and anti-tribal treaty ideology. In terms of the use of the terms “anti-Indian” and “anti-Indianism” in the article above, the explanation shown below provides pertinent information. Posted in Commentary, Information and tagged 40th Legislative District, Anti-Indianism, Boldt Decision, Campaign Contributions, CERA, Citizens Alliance for Property Rights, Debra Lekanoff, Elaine Willman, Human Rights, KGMI, Kris Halterman, Michael Petrish, Native American Treaty Rights, Native Americans, November 2018 Election, PDC, Public Disclosure Commission, Rud Browne, Saturday Morning Live, Skagit County, Skagit County Republicans, Supremacy Clause, U.S. Constitution, Whatcom County. Bookmark the permalink. 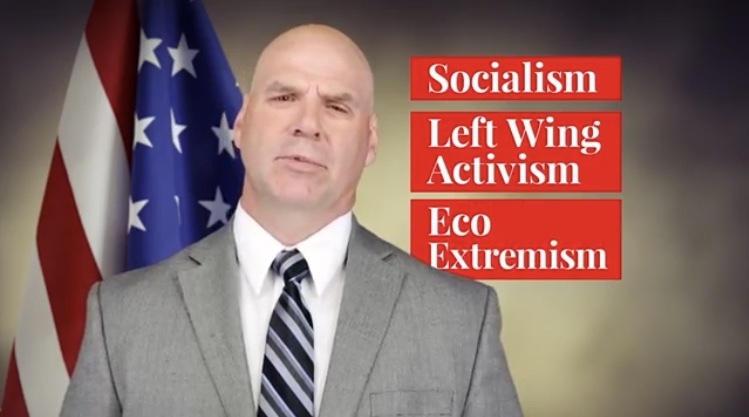 This report uncovers the deplorable agenda behind the 40th LD Republican candidate Petrish and his settler support squad of Halterman,Willman and Pasma. The virulent disease of racial hatred that infects them is also indicated by the secondary symptoms of misogyny and compulsive prevarication. This local Republican campaign is a current example of the war of cultural genocide that the Europeans have relentlessly waged following their conquest of the “New World”. Five centuries and counting….. In 2017, ten years after the United Nations General Assembly voted to extend the international human rights regime to Indigenous Peoples, the governments of Canada and the United States—both of which voted against the 2007 United Nations Declaration on the Rights of Indigenous Peoples (UNDRIP)—began to undermine international human rights law on behalf of the petrochemical industry. Having mustered local and state police–as well as private mercenaries like TigerSwan–against Indigenous human rights activists, journalists and tribal governments, the petroleum states of North America are now out to destroy democracy. As reported at Indian Country Today, the collusion between oil companies, law enforcement, and the private military security company TigerSwan targeted Lakota People’s Law Project attorney Chase Iron Eyes as part of a “racially-motivated criminal conspiracy by oil companies and mercenary security corporations to deny Native Americans and their allies their civil and treaty rights.” This violation of the Federal Civil Rights Act against the Standing Rock tribe–for protecting its primary source of fresh drinking water from the oil company that moved its pipeline from a white community to the edge of the Standing Rock reservation–included a military operation and media campaign to racially profile the Lakota people as terrorists. In 2010, the four rogue states that voted against UNDRIP—Canada, Australia, New Zealand and the US–initiated public relations campaigns designed to persuade their citizens that while institutionalized white supremacy in these modern states is an unfortunate consequence of British imperial history, it is preferable to allowing Indigenous nations to have equal standing. In September 2018, the U.S. Supreme Court denied voting rights to American Indians in North Dakota, the location of Standing Rock. On October 12, 2018, the Supreme Court of Canada attacked UNDRIP head-on, stating that Indigenous rights are “highly disruptive” to the lawmaking process. When James and Laura McKinney assumed executive-level positions in the Whatcom Tea Party, aka Common Threads Northwest, and at Whatcom Business Alliance, they were chosen for their professional public relations skills. As a former employee of the US Chamber of Commerce–an organization that opposes unions and occupational safety–Laura directs WBA communications for the fossil fuel export lobby supporting the Salish Sea oil refineries in their war against the Affiliated Tribes of Northwest Indians. In January, the Center for World Indigenous Studies in Olympia published my six-part special report Anti-Indian Movement on the Salish Sea, the result of a four-year investigation into Wise Use terrorism in Whatcom County, 2013-2017. Part six is where the McKinneys enter the picture.